New Moon is officially in the theaters!! 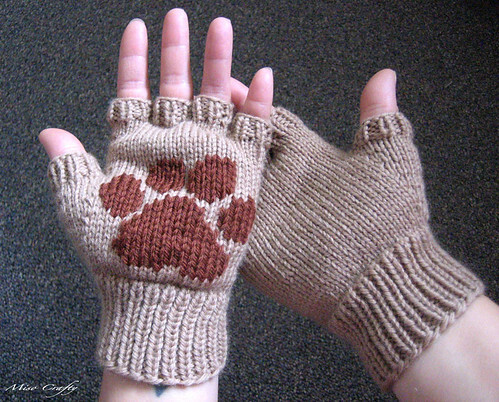 And to commemorate the glorious event, I've knitted up a pair of Jacob's wolf paw gloves! After all, New Moon concentrates a lot more on Jacob and the wolf pack so it only seems natural to do a Jacob related project. Right? Anyways, I used Magic Loop rather than the DPNs the pattern calls for, and when it came time to work the fingers I was able to let the piece sit on the circular needle cable while I worked the fingers with DPNs. That definitely saved me time from having to transfer the work to a scrap piece of yarn. I'm not sure if my tension is getting better with each project or what, but I actually got gauge with the recommended needle size! And since my US5 circular needle in the 32" length was an Addi, knitting these gloves up went über fast and über smoothly! Yay for not having to fight with a crappy needle/cable join! 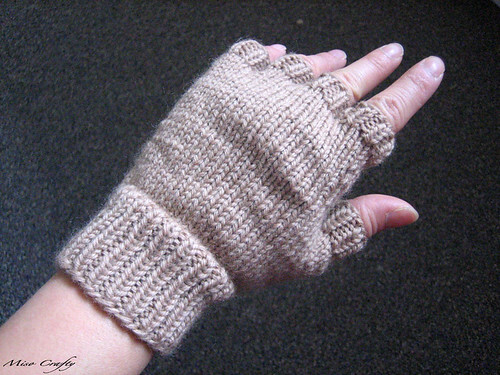 I didn't have a set of US5 DPNs, so I ended up using US4 for the ribbing on the fingers. I think this worked out for the best though, cause the fingers fit perfectly. If I had used the US5 I think the fingers would be a little on the loose side, too loose for my liking. The pattern itself was super easy and very well written. It's a pattern I would definitely recommend to a beginner who is ready for a challenge. Not to mention that it's such a fast knit that it would warrant instant gratification, something that a newbie knitter would need to keep that knitting drive going. If I could have dedicated a day to making these, rather than a few hours here and there, I think these gloves would have been finished in a day. Definitely a pattern to think about when you need a quick gift! And if you use the recommended yarn you can actually get 2 pairs of gloves! 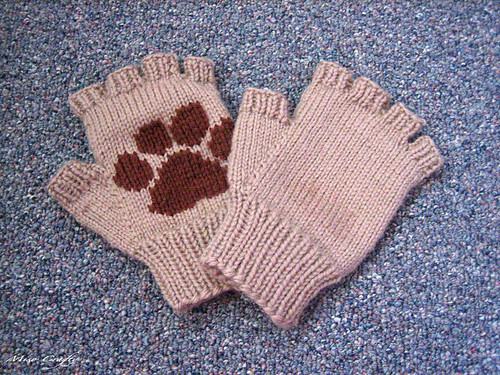 One in the tan/beige colorway, and the other in the brown colorway with a tan paw print. 2 pairs of Jacob inspired gloves for $7, now how awesome is that? I screwed up the duplicate stitching of the paw print a few times, mainly cause I was watching a movie at the same time and wasn't paying much attention to what I was doing. 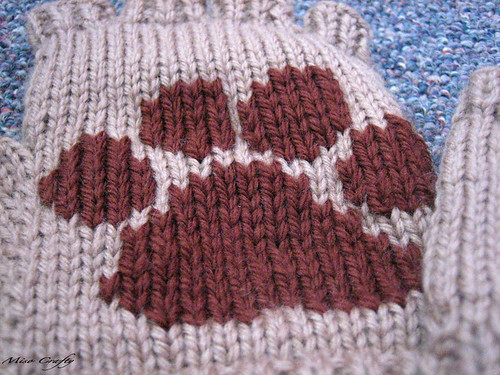 The pattern calls for the paw print to be stitched onto only one glove, but I'm thinking of doing the other glove...cause I like symmetry when it comes to projects like this. But we'll see if I actually get around to doing it. I'm also not a fan of the placement of the print. I had followed the pattern as to where the placement should be, rather than figuring it out myself. 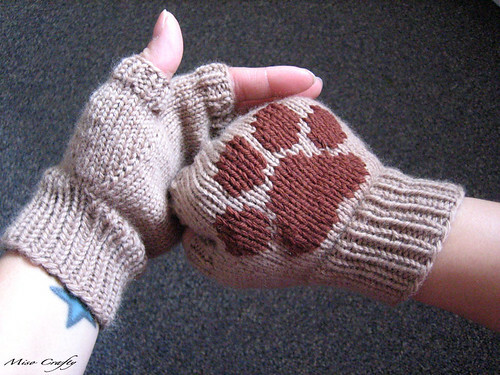 I think if I were to knit up these gloves again I would definitely make the print more centered on the palm and not so low. I was also not sure how I felt about the paw print being on the palm, as per the pattern. I could see why it would be placed there, but I think it would also look great on the back of the hand. And truthfully, I think the pint looks better on the back, since there is more hand to cover and the print sits nicely. On the palm my paw looked a little crowded. Now this could be due to the fact that I have small hands...I guess you can wear it any way you want, how's that for versatile? All in all I'm happy with how the gloves turned out. And you have to admit, even if you're not a Jacob fan, that these gloves are pretty darn cute! They look very cool! We went and saw the movie on Friday night and now my boyfriend has decided he likes Jacob better then Edward. He says Edward is mean because he leaves her and Jacob never does. I told him it doesn't matter because I am Team Emmett anyway. ha ha! I didn't like the movie as much as the first but I also didn't really like the New Moon book as much as the first either. Thanks! I wasn't a fan of the second book either. I think the entire time I was reading it I kept getting the strong urge of wanting to slap Bella across the face! Those are the most adorable things I've ever seen! I'm torn between Jacob and Edward. I think I started out leaning toward Jacob, but then went with Edward. My daughter saw the movie last week with a friend. I will probably have to wait until I can get it on Netflix! WOW, they are SO CUTE!!!!!!!!!!!!! I found your page accidentally when I was searching for a pic of Bella's tote bag, and I absolutely love your Jacob paw gloves!!!!!!!!!!!!!!!!!!!!!!!! Thanks Maria! What a lovely compliment! I guess the weather in Spain could be a deter people from wearing knitted wool gloves...which is a shame! Oh well. 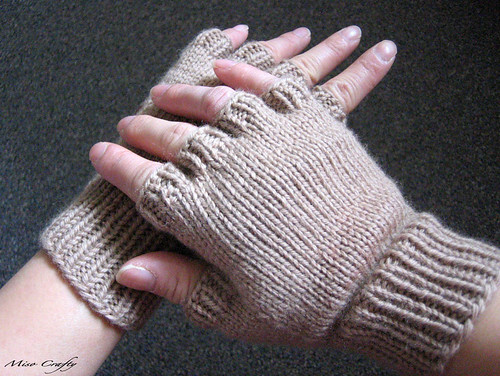 I have worn these gloves so much during the winter here that I think I need to make a new pair for next winter! But I have way too many projects on my list that I highly doubt I'll be able to get to it. You should try knitting! It's fun! Thanks for stopping by my blog! Hey are you Selling these! i would so buy! Thanks for stopping by my blog! Unfortunately I have no other way of contacting you, as blogger claims that your profile is set on private. Anyways, sadly, I'm not selling these gloves as I do not have the rights from the designer to do so. If you knit, the pattern is actually a very easy and quick one. You should check it out on Ravelry!